I'm saddened by the fate of your bill to prepare for downfall of the United States by buying an aircraft carrier. I suspect it failed because it was too narrowly written. Buying an aircraft carrier isn't enough. You need to think bigger. When America collapses, many Wyomingians will lose important sources of income like federal faith-based funding and oil, gas, and farm subsidies. Your bill did not address ways to replace them. Certainly the state does not produces enough oil, sheep, timber, and wolf hides to fund both a military build-up and such additional grants and subsidies. Wyoming would need to exploit new natural resources to pull it off. I suggest you rewrite the bill to address this funding issue. Add a section that will require the state to employ traditional income generation strategies. No, I'm not talking about taxation--that's plain evil--I'm saying you should fund the government by seizing someone else's natural resources. Invading Northern Utah and taking the Great Salt Lake's salt and sea monkey resources is your best bet. Everyone needs salt, and the Great Salt Lake is a great place to harvest it. And sea monkeys? Well, there are two major places in the world to get them, The Great Salt Lake and the Dead sea in Israel. Think about that for a moment. 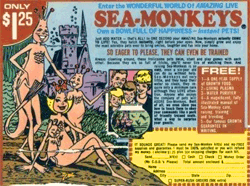 Come Armageddon, Wyoming could corner the sea monkey market. You'd have every nerdy ten-year-old in the world by the balls. They'd have to pay whatever you asked. It would also offer you an opportunity to use your aircraft carrier to project power and establish Wyoming as a true post-American superpower. You could sail it down the Bear River straight into the Great Salt Lake. Sure, you'd need to do a lot of dredging and, maybe, divert some water from the Snake River, but hey, that's what nukes are for. Again, think about it. Wyoming could be the first Sea Monkey Empire.